Increasing cost pressure, high demands on part quality and frequent change of batches – the manufacturing of car brake discs is a difficult field. Particularly in the spare parts market, where users must request individual machining solutions that can be retooled for new workpieces without long downtimes. With this in mind, EMAG develops highly flexible production lines for brake discs. This machining is typically completed with four machines that are interlinked by an EMAG TrackMotion system. With these machines, users can modify the system at any time, for example, by ‘switching out’ a machine from the process if not all steps of the operation are required for a workpiece. 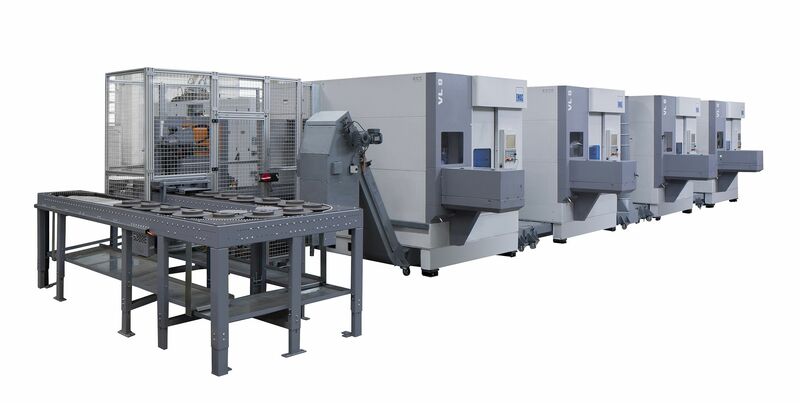 In addition, EMAG can integrate several identical machines into the chain that perform the same operation in parallel. In this case, the TrackMotion distributes the workpieces to whichever machine is available. Tooling work on a machine does not mean downtime for the production line. Short cycle times in the machines result from fast loading by the pick-up working spindle, high linear feed rates and short turret indexing times. Another important feature for the fine machining of friction ring faces on the brake disc is the straddle tool, which is integrated into the process. EMAG can place the tool on a special console in the machining area. As a result, the process is perfectly dampened, and the surface quality on the component increases. In recent decades, EMAG has achieved an excellent market position in this field. The flexibility and productivity of the lines plays a decisive role. Equally important, however, is the quality of the machines. It is not uncommon to see EMAG machines in operation for several decades – a decisive advantage for users who need to compete in a market with increasing cost pressure.